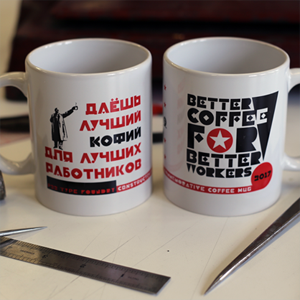 Over periodic intervals since 1995, when the Constructivist fonts were first introduced by P22, we have released a limited edition coffee mug—always with the slogan “Better Coffee for Better Workers” and V. I. Lenin holding up his morning brew. 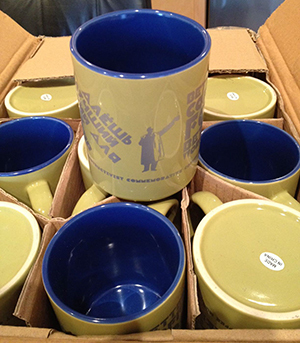 To date there have been 12 slightly different Constructivist mugs marked with the year the mug was printed. We have had more than few requests to bring them back, so now for 2017 we bring you the latest iteration of the Constructivist Mug for you to enjoy your morning covfefe. We have just found an extremely limited supply of our 2010 edition of this mug, available while supplies last.